More for less. Innovation. Reform. Devolution. There’s no shortage of buzzwords around right now, nor lack of big ideas and lofty ambitions. It’s a time of change and opportunity for those with a vision to realise and a clear sense of where they want to go. At the same time, for those tasked with actually delivering better outcomes, there may be uncertainty, confusion and even a sense of trepidation. Change, after all, means doing things differently, if it’s going to mean anything at all. From the rehabilitation revolution and co-commissioning of services for vulnerable people, to cross-agency collaboration, partnership working with the private sector and new technology, the charity sector is going through a period of unprecedented transformation. Which means the leaders, managers and their teams are as well. The focus is still firmly fixed on better outcomes and more value for money, so how much attention do the people expected to actually secure these twin objectives get? We don’t know for sure, but we do know that the more attention they get, the more likely they are to be productive, to satisfy service users and to help the bottom line, whether in the public, private or voluntary sector. Of course, engaging staff is not a new concept. I would argue that we shouldn’t only be talking about engaging staff, but talking about inspiring them. Last year, the Economist Intelligence Unit and Bain & Company researched 200 senior executives about staff engagement and productivity. 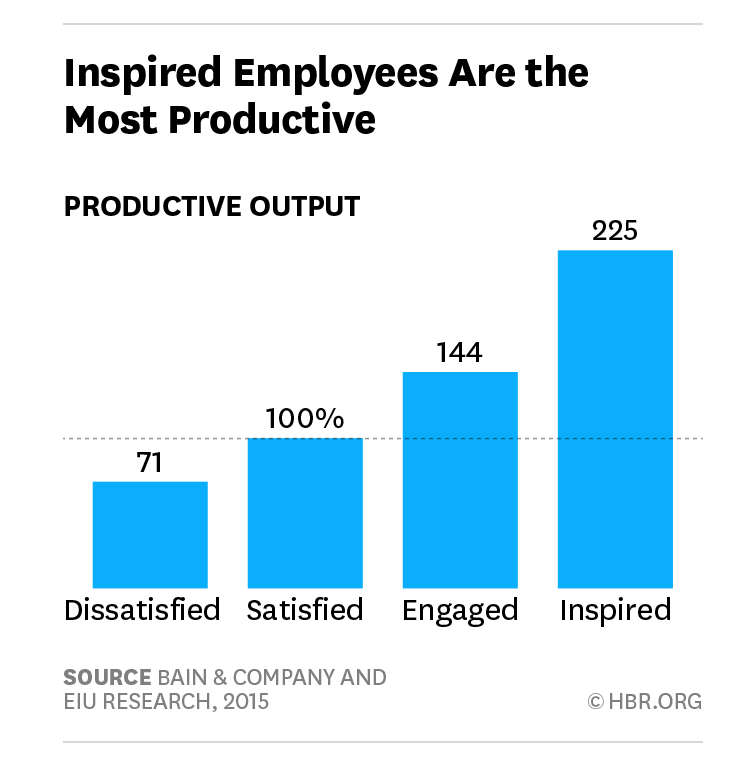 They concluded that if “satisfied” employees were productive at an index level of 100, then “engaged” employees produced at 144 while “inspired” employees scored 225. In other words, it would take two and a quarter “satisfied” employees to deliver the same as one “inspired employee”. With austerity here to stay, that is a figure which should give us all pause for thought. But there’s more and it is particularly pertinent to the sector we and our clients specialise in. The authors concluded: “When they encounter a wall, satisfied employees hold a meeting to discuss what to do about walls. Engaged employees begin looking around for ladders to scale the wall. Inspired employees break right through it”. So when colleagues return from their summer holidays how do you move them from being just satisfied (or worse…) to being engaged and inspired? Luckily we have developed a model to help you lead your people through this change successfully. Inspiring your people – the model. Get the functional bits right. This means the financial, contractual and environmental factors. Without these, the rest will not land. In my experience getting the basics right first is fundamental, if these are not in place you are stuck at first base (no matter where the change programme Gantt chart claims you are). Identify your top performers, understand their motivations and replicate them. Engage them as your champions. Publicise their successes across your organisation. Our first port of call is often to build a comprehensive content calendar for our clients, highlighting external successes to internal audiences. Bringing ‘the outside in’ will encourage your people to see the outward results of their efforts. Criminal justice should never be short of inspiring stories, of lives transformed, justice secured or the vulnerable supported. Understand the culture of your organisation. Those elements that block innovation and creativity – things like unnecessary meetings, cumbersome approval processes will disempower managers, leading to stagnation, silos, micromanagement and in extreme cases blame culture. Often we find people across the organisation want a more agile culture – to get on with the job at hand – our task is helping make this a reality. This formed the keystone of a recent change programme we supported, working with senior leaders to understand and teach them to foster the culture they wanted to see. Direct benefits of the project included the first real agreement on the desired culture by the senior team. Signing up to the charter meant they had to think more strategically about their actual role in making it happen. Also because they had a greater depth of understanding they were able to coach their teams in a powerful and personal way. Taking personal responsibility for the changes is crucial to success. Encourage those leaders to build on their strengths and not focus on shoring up their weaknesses. By excelling and becoming known for their positive qualities, they will naturally be able to inspire those around them. Whether this forms part of a formal mentoring programme or not, the importance lies in bringing people together across the organisation, allowing them to work together and building key relationships and understanding. The best example I have been involved with was an manager’s buddying network which brought together managers from across different regions and countries. Its remit was to problem-share and critically to problem-solve! It grew from 10 to 40 members in two years and was instrumental in delivering the organisation’s strategy and culture change programmes. Build a culture of trust through transparency, honesty and fairness. Visibly reward good practice and don’t focus on highlighting poor performance. In the past I have found this most effective when the culture is rooted in strong values, those that teams have had input in and are visibly encouraged to uphold. It also helps if personal development plans reinforce the values, although it should be more carrot than stick. Learn to learn, develop leaders early and at all levels of the organisation. Empowering your people to take control of their destiny will inevitably drive the organisation forward. In rehabilitation, policing and victim services, your people will have a real passion for what they do – it’s not a job it’s the job – so harness their dedication to keeping people and communities safe. Creating inspired and inspirational people is a process, it won’t happen overnight and without effort, there might also be some bumps along the way. Recognise this is the case and keep people on track by effective communications, creating quick wins and rewarding those who engage along the way.